Numerical testing and visual sharpness are two very different things. Of the two, visual sharpness is probably more important but it is also harder to define. I previously promised to return to the issue of visual sharpness and that is indeed the theme of this contribution. It follows-on nicely from my thoughts on Tamron’s new 18-270mm super-zoom because visual sharpness is just one of the subjective factors that lead people to say that the pictures taken by one lens are better (or worse) than those taken using a different lens. Other factors include “bokeh” (the way in which out-of-focus regions are rendered), diffraction (causing “starburst” effects in pictures taken at night where there are small lights against a dark background) and, especially in the days of film, colour rendering. Once again there is more here that can be covered in one ‘blog entry so for now let’s think only about visual sharpness. It would be lovely if there were a way of photographing a standard real-world scene and comparing each image with other pictures that were taken at different times using different lenses. Sadly, that isn’t really possible so to ensure consistency from one test to another it is common to use a standard (flat) test target that can be processed to yield a set of figures characterising the lens’ performance rather than simply relying on visual sharpness when the image is inspected by eye. A flat target is easier to photograph consistently than a three-dimensional set, although if space allowed it would be possible to have a “test scene” stored ready for use with any lens that was supplied for evaluation. The only problem then would be how to quantify the lens’ performance in a consistent way. So the reason for using technical testing is to provide consistency: it does NOT tell you exactly how the lens will perform in the real world. Visual sharpness may be subjective but it is also more important since the way an image “looks” is more important than the numbers it generates when processed in a certain way! The biggest differences between a technical chart and real-world scenes are contrast and frequency. Contrast refers to the tonal difference across boundaries between adjacent areas: technical charts normally have high contrast whereas many real-world scenes have relatively low local contrast even though the overall contrast of the image may be high. Frequency refers to the sharpness of the boundary between adjacent areas: technical charts normally have sharp (high frequency) boundaries whereas many real-world scenes have softer boundaries. It is possible for a lens manufacturer to weight optical performance towards particular types of testing, including the attainment of higher Modulation Transfer Function (MTF) figures in order to excel in that sort of technical test. It is also possible for lower-MTF lenses to produce visually very pleasing pictures. The lesson is not to get too carried away with numbers. Always keep in mind that numbers are nothing more than data until they are interpreted, at which point they start to represent meaningful information. The example image shown above is a visual representation of figures that suggested a certain zoom’s performance was best at f/8. The zoom (Canon’s 70-200mm f/4L IS USM) was numerically slightly softer when used wide-open and was much, much softer when set to its f/32 minimum aperture. 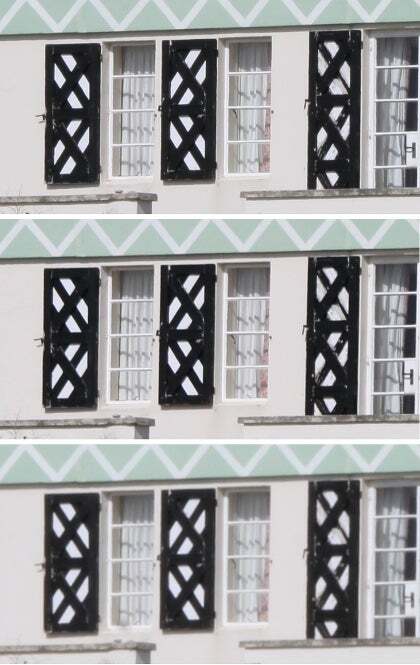 The sections reproduced here (taken at f/4, f/8 and f/32, top to bottom) suggest that the sharpest rendering was obtained at f/4, not f/8 – although there is not much to choose between these two images. It is very clear, however, that the section from the f/32 image is much, much softer than both of the other two images. And it is for this reason that I often stress, when writing WDC’s lens tests, that small aperture settings (f/22 and below) should always be avoided whenever possible if maximum visual sharpness is desired.